Force Touch (or 3D Touch) is an impressive haptic feedback technology that is rolling out through updated Apple hardware, with all of the newest model Mac laptops having a Force Touch trackpad included. 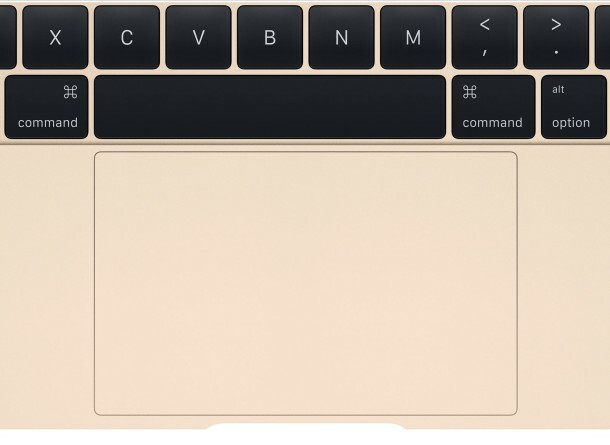 The basic click functionality of Force Touch is often not even noticed by MacBook users, but one thing that is frequently discovered is Force Click, which is the secondary firm press that happens once a user has initially clicked on the trackpad but then presses a little harder. That second firm press Force Click functionality performs a variety of functions on the Mac, ranging from data detector lookups like dictionary and thesaurus, to Quick Look, to scrubbing video, it’s multi-use and what exactly it does varies throughout different aspects of OS X and its applications. Most Mac users like Force Click and it can be very useful once you master it, but if you’ve found the Force Click secondary firmer press to be a nuisance with the data detector lookups popping up when you weren’t necessarily expecting it, you can disable that feature completely. By disabling Force Click, the trackpad will basically function like any other trackpad that has existed on the Mac, it simply turns off the secondary deeper press features – it will not disable the trackpad itself. With Force Click disabled, you can press the trackpad as hard or as soft as you like, and you will never trigger the secondary data detector features. I’ve noticed turning this off to be particularly helpful for newcomer Mac users who have arrived to the platform from a traditional Windows PC laptop, especially if they have enabled the literal right-click or make frequent use of tap-to-click, but it can also be helpful to turn off for longtime Mac users who traditionally use a firm click when selecting and clicking items as they use the computer. 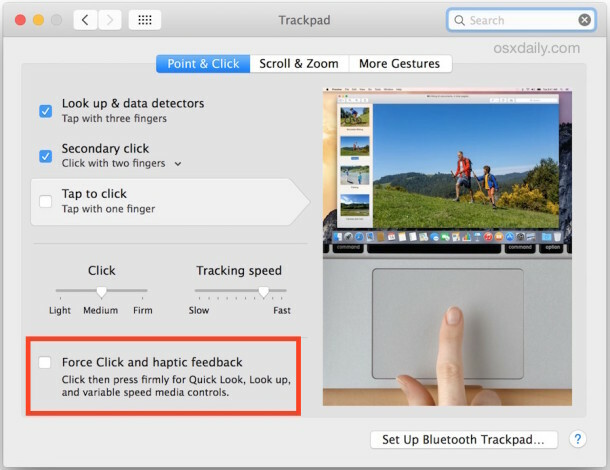 With Force Click enabled, those firm presses can lead to the unexpected behavior, but by turning the feature off, the MacBook Force Touch trackpad will behave just like any other trackpad. Force Click (once called Force Touch) on Mac is similar to the 3D Touch feature in iOS, and the names are really interchangeable in that sense. You will only find this setting available if the Mac has a Force Touch trackpad, as there would be nothing to disable or enable without one. After updating OS X this was turned off, but I wanted it turned on. Not sure why that happened, but thanks, just reversing instructions I was able to get the force click force touch feature back on the MacBook Pro. Kind of an awkward weird name for a feature, by the way. What you’re talking about is not part of 10.10.3 at least not in the way your article describes. Obscure, you clearly did not pay attention to the article. This requires a new MacBook with Force Click. If you don’t have the option, that means you don’t have haptic feedback or a Force Click trackpad. That’s like complaining you don’t have a 4WD button when you have a 2WD car, can’t add a feature that doesn’t exist. Will this allow the 4 finger function for moving windows or open programs? i noticed they didn’t have that option anymore so i wonder if you turn of force click if that will come back.